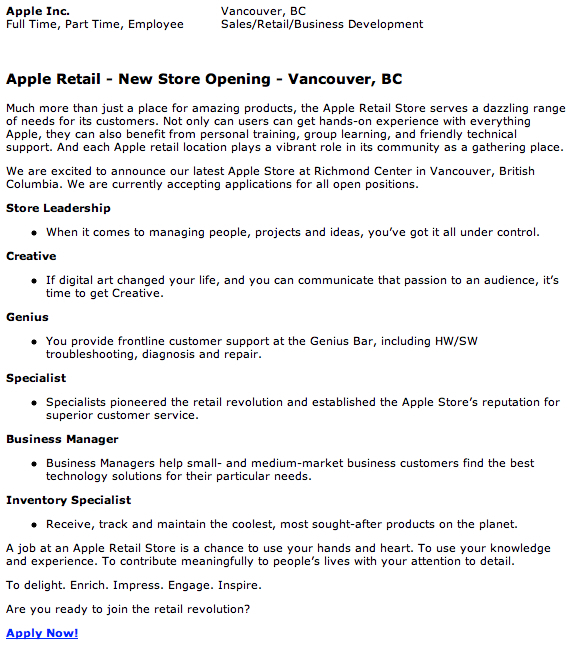 Get your sleeping bags and coffee ready, as Apple Canada will be opening British Columbia’s third Apple Retail Store. According to the Monster job site, the location is to be opened in Richmond, British Columbia, specifically located inside of Richmond Center. This will mark the third Apple retail store in Metro Vancouver. Chalk up another store that will have free mall parking (the other is Oakridge Centre)–although the store is located on the perilous No.3 Road in Richmond, a driver’s worst nightmare. We are excited to announce our latest Apple Store at Richmond Center in Vancouver, British Columbia. We are currently accepting applications for all open positions. Once again, as Apple tradition would have it, t-shirts will be given out to the first 1000 visitors. So if youâ€™re in or near Richmond this Fall 2010, get up early and be prepared to stand in line for the grand opening!